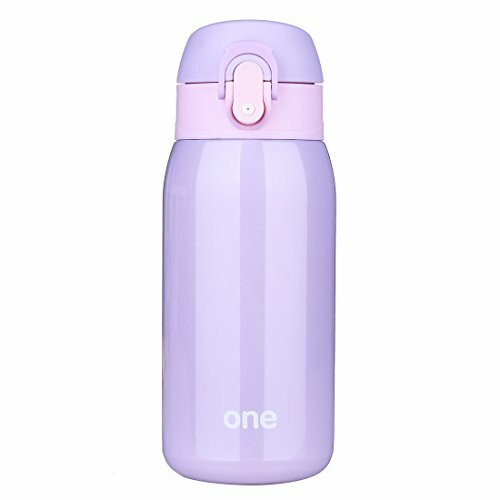 320ML/11oz capacity, perfect size, lovely and unique. 100% BPA free and FDA approved. Food grade double wall vacuum stainless steel, keep water hot for 12 hours(retain 61℃ at 8 hours, 53℃ after 12 hours), cold for 8 hour(at 9℃ after 8 hour). A great gift to yourself or someone your Cherished. PERFECT SIZE : 11oz/320ml fits your every bag and you can take it wherever you go. MATERIAL- 100% BPA Free, food grade 18/304 stainless steel interior, Non-leaching & toxin-free, Eco friendly, durable and safe to use. EASY FLOW: Unique cup mouth design makes your drinking more careful and flowing more easily. 360° LEAK-PROOF: Silicone loop makes the first guarantee and leak-proof lock gets the second guarantee. All these two make a perfect leak-proof water bottle. POWERFUL FUNTION- ONEISALL vacuum insulation technology for maximum temperature retention; keeps hot for 48 hours, it will long keep the temperature of the drink. 95 ℃ hot water is more than 76 ℃ even after 3 hours, 56 ℃ after 9 hours, 40 ℃ after 12 hours.